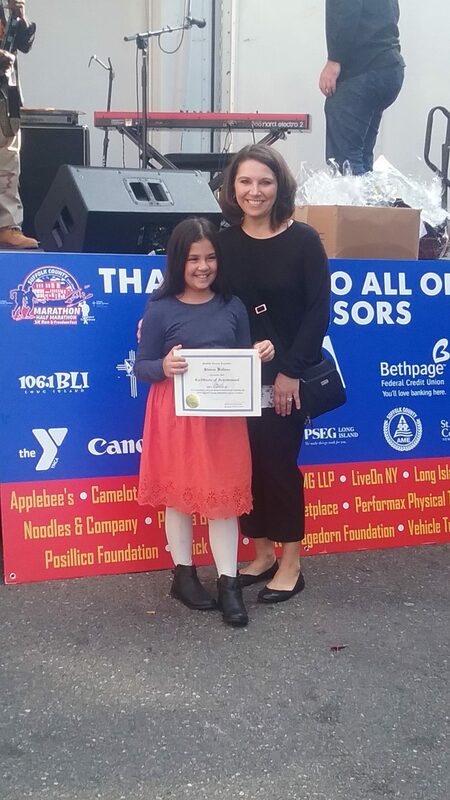 Laddie A. Decker Sound Beach School recently celebrated 4th grade student Mia Carvajal’s achievement as the winner in the Suffolk County Marathon Essay Contest. Suffolk County Executive Steve Bellone invited students in kindergarten—8th grade from all schools in Suffolk County to participate in this prestigious contest. In order to participate students had to write an essay about appreciating veterans, living a healthy lifestyle or engaging in community activities. Carvajal’s essay was about ways to bring the community together by engaging in community activities. Once all essays were received, student contest submissions were separated into three categories; grades K-2, grades 3-5 and grades 6-8. Only 9 students from throughout the county were selected as winners.